Whether you’re a business owner inundated with messages on multiple online channels or a social media manager tasked with collecting and improving online reviews, Podium is a game changer. Sparking text message interactions with customers. Providing critical data that showcases online sentiment toward your business. Giving you actionable solutions to improve reviews. Helping you earn more reviews – and consequently rise in Google Local results. Ensuring no messages (or opportunities) are missed. With Podium, modern interactions become easy and convenient. Podium works with more than 20,000 businesses and powers 4 million interactions every month. It was named on Forbes 2018 Cloud 100 list of top private cloud companies, as well as listed among Forbes’ 25 Next Billion Dollar Startups. Watch this video to learn more about how Podium got started, and keep reading for a deep dive into Podium’s features. A recent study found that 85 percent of consumers are likely to reply to a text message from a business, and that half of consumers actually prefer using text message to interact with businesses. 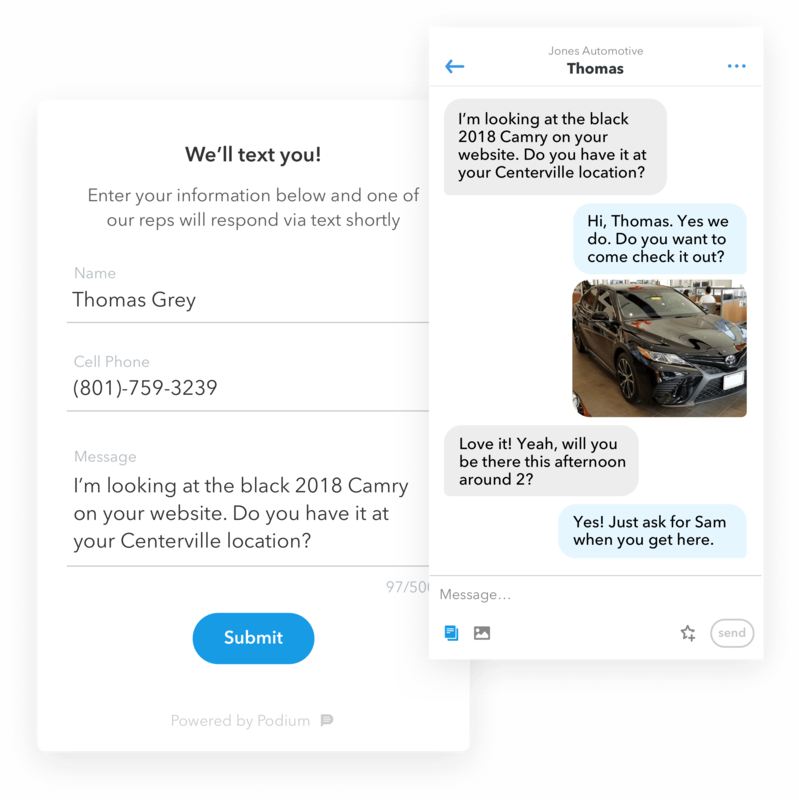 Spark text message interactions with your customers by implementing Podium’s Webchat on your site. Webchat is simple, frictionless, and takes seconds to complete. Once users have shared their contact info, you can follow up on text messages, making it more likely the conversation will keep going. Customers are willing to leave reviews — they just need a convenient way to do it. With so many different channels, usernames and passwords, even something as simple as logging into different messaging platforms can be time-consuming. It’s also a recipe for lost leads every time you miss a message. 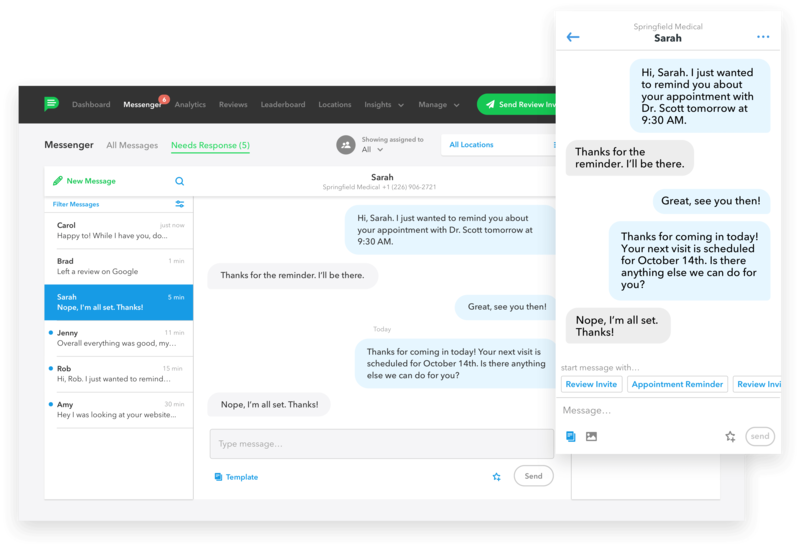 Podium simplifies the messaging experience, giving you one central messaging dashboard where you can read and respond to messages from Webchat, Facebook Messenger, SMS, and Google Click-to-Message. Follow up on negative reviews. Collecting more reviews is a win for any business. Not only do additional reviews give potential customers a better understanding of your business, but it can also bolster your position in Google Local listings. Ranking high on Google Local listings will bring more traffic, calls, messages, and business your way. Podium makes collecting reviews quick and painless for customers and businesses alike. 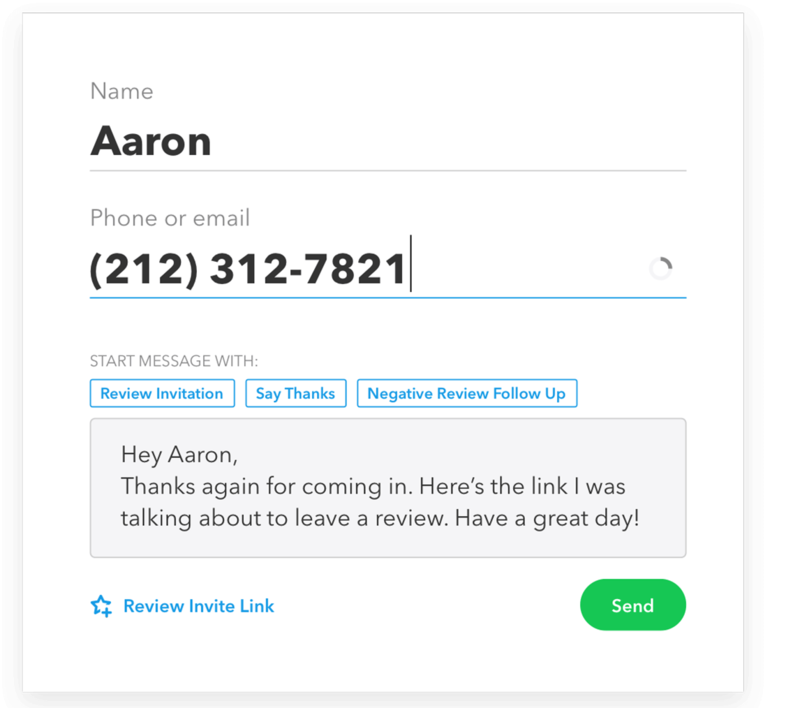 There are customizable templates that allow you to quickly send out messages that briefly prompt customers to leave a review. The link leads them to a frictionless and fast reviewing experience, making it much more likely they will complete the review. The importance of gathering these reviews can’t be stressed enough. The average Podium user, for example, sees a 6 percent increase in revenues thanks to reviews. “Our sales have increased. Our traffic has increased, and our customers aren’t shy to tell us it’s because of our reviews,” says Christen Cawley, who relies on Podium in her role as marketing director at Shannon Fine Jewelry. Podium will alert you any time you have a new review on any channel, so that you can thank customers for their thoughts and also address their concerns. Negative reviews happen to even the best businesses. Dealing with them quickly and strategically is a key part of online reputation management. From the Podium dashboard, it’s easy to quickly identify trends among your reviews. Podium will provide data on frequently used keywords to give you a better understanding of where you’re excelling and where you need improvement. For example, let’s say an employee’s name is coming up repeatedly with raving reviews – give that person a raise! Or, on the flip side, maybe someone’s name keeps coming up in conjunction with negative reviews, signaling it’s perhaps time for additional employee training. Podium provides the data for you so you can spend your time acting on the data rather than gathering it. David Rotman of Rotman’s Furniture uses Podium to quickly identify negative reviews and reach out to customers to rectify any bad situations. For example, he discovered a review where a woman wanted to return and replace her mattress because it was too firm, and the box spring was damaged. “Once I saw the bad review, I called her up right away,” Rotman said. “I sent her a reimbursement check for a mattress topper she purchased to make the mattress softer. I also sent out a technician to look at the box spring, which we are replacing for her. Want to see how you’re performing in comparison to your competitors? You can choose up to five competitors and Podium will track their reviews and show how you stack up against them. You can give multiple employees access to Podium with their own accounts, so it’s easy to see who’s interacting with who, how many interactions they’ve completed, and what kind of results they’ve been able to accomplish. The data is shared among employees with a real-time leaderboard. Competition is a great motivator and gamifying (if not incentivizing) customer service can lead to better performance all around. Podium pricing is based on your business’ size and needs. You can choose all their services (including the messaging dashboard, Webchat, review monitoring, and review collecting) or pick and choose what’s right for you. They’ll review your needs and then present packages and pricing options. Now that you’re familiar with Podium, do you think it can help you manage your online customer interactions and reviews? If so, you can reach out to Podium to watch a free demo. Get more reviews, more insights and more customers. Watch a free Podium demo now.